Hodie 2a vice lecta est Billa, intituled, "An Act to enable the Trustees and Testamentary Guardians named in the Will of Thomas Hesketh, late of Rufford, in the County of Landcaster, Esquire, deceased, to perform the same, and make Leases for Lives in his settled Estate, for paying his Debts, during his Son's Minority, in Ease of an Estate devised by him to be sold." Their Lordships, or any Five of them; to meet on Monday the 28th Instant, at the usual Time and Place; and to adjourn as they please. 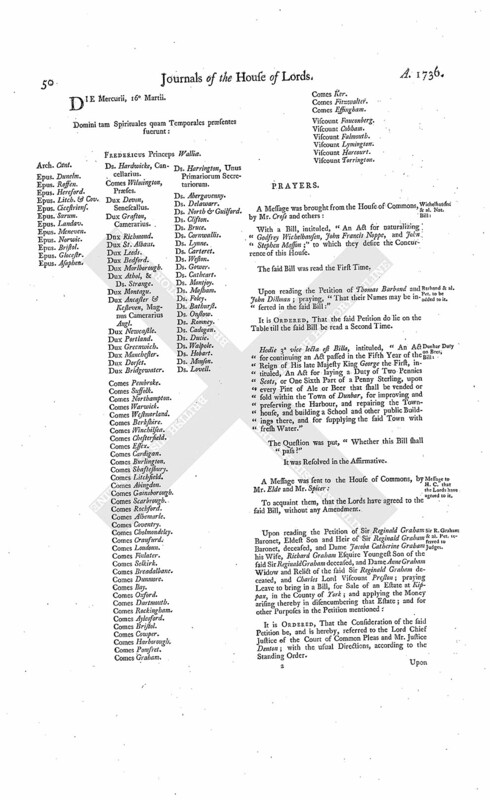 Articles of War and List of Promotion of Officers. The House being informed, "That Mr. Arnold, from the War-office, attended:"
"The Articles of War intended to be established for the Year ensuing." And, "A List of the Promotion of the Officers of the Army, since the 25th of March 1736; distinguishing such of the said Officers as were in His Majesty's Service, or in Half Pay, before the said 25th of March; with the Dates of the Commissions of such Officers." And the Titles of the said Articles and List were read. Ly. Lawley's Pet. referred to Judges. Hodie 1a vice lecta est Billa, intituled, "An Act to enable the Trustees in the Will of Thomas Kellow Gentleman, deceased, to sell Part of his Estate, for the Payment of his Debts." Upon reading the Petition and Appeal of the Honourable Edward Brabazon Esquire, from and against an Order, or Decree of Dismission, made and pronounced by Sir John Mead deceased, late Chancellor of the Regalities and Liberties of the County Palatine of Tipperary, in the Kingdom of Ireland, on the 17th Day of April 1686, in a Cause wherein the Honourable Edward Brabazon Esquire and Cæcilia his Wife (afterwards Earl and Countess of Meath, in that Kingdom) were Complainants, and the Right Honourable Edward Lord Ward, William Ward Esquire his Son and Heir, by his Guardian the said Edward Lord Ward, John Levet Esquire and Mary his Wife, were Defendants; and praying, "That the same may be reversed; and that the Appellant may be decreed to the Possession of certain Premises in Question, in the Appeal mentioned; and that William Lord Dudley and Ward may convey what Right he has at Common Law (if any) to the Appellant; or that he may have such Relief given him as this House, in their great Wisdom, shall think fit:"
It is Ordered, That the said Lord Dudley and Ward may have a Copy of the said Appeal; and do put in his Answer thereunto, in Writing, on or before Friday the 15th Day of April next; and that Service of this Order on the said Lord's Agent or Solicitor be deemed good Service. 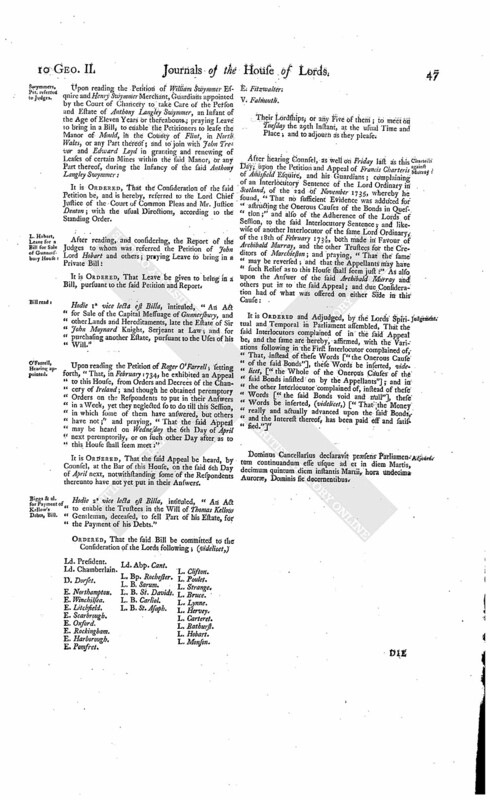 The House being informed, "That Mr. Brereton attended, in order to deliver in Copies of Papers and Proceedings, in the Cause wherein Edward Brabazon Esquire is Appellant, and William Lord Dudley and Ward Respondent; and in a Cause wherein Lord Howth is Appellant, and Eleazer Peirson Respondent:"
He was thereupon called in; and delivered the said Copies at the Bar; and attested upon Oath, "The same were true, he having examined them with the Originals in the proper Offices in Ireland." Elliot to have an Extract of Decree, as usual in Scotland. Upon reading the Petition of Thomas Elliot; setting forth, "That he, having brought his Appeal from a Decree of the Lords of Session in Scotland, expected to have an Extract thereof in the usual Manner, in order to bring the same before this House, upon hearing the Cause; but, upon Application of the Respondent, the said Lords of Session ordered, "That the Informations and Memorials presented to the Court by either Party should be inserted in such Decree or Extract of the Proofs;" and praying, "In regard this Direction is entirely new and unprecedented, and will be attended with an extraordinary Expence, that the Clerks of the Process be ordered to extract the said Decree in the usual and accustomed Manner, without inserting therein the said Informations and Memorials; or to give the Petitioner such other Relief as to this House shall seem just:"
It is Ordered, That the said Clerks do make the Extract of the said Decree, in the usual and accustomed Manner; and do mark the several printed Informations and Memorials presented to the said Court in this Cause, and sign the same, in order to their being produced before this House, without inserting them in the said Extract of the Decree. Counsel (according to Order) were called, to be heard, in the Cause wherein Francis Charteris and his Guardians are Appellants, and Archibald Murray and others Respondents. It is Ordered, That the further Hearing of this Cause be adjourned till Monday next; and the Cause for that Day be put off to the Friday following. Dominus Cancellarius declaravit præsens Parliamentum continuandum esse usque ad et in diem Lunæ, decimum quartum diem instantis Martii, hora undecima Auroræ, Dominis sic decernentibus. Viscount Fauconberg. Ds. (fn. 1) Clifton. As was likewise, the Answer of Roger O'Farrel, to the Appeal of Thomas Fetherstone and others. Abp. of Canterbury takes the Oaths. John Lord Archbishop of Canterbury took the Oaths, and made and subscribed the Declaration, and also took and subscribed the Oath of Abjuration, pursuant to the Statutes. D. Athol takes his Seat as Lord Strange. 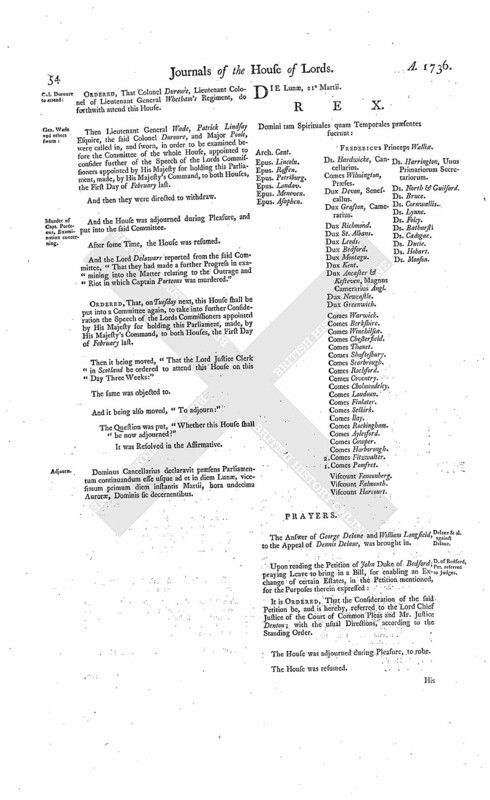 His Majesty having caused a Writ of Summons to Parliament to be issued to James Duke of Athol, directed "To James Murray, of Strange, Chevalier;" he thereupon sat this Day in Parliament, after the Death of his Great Grandfather James Lord Strange; having, at the Table, first taken the Oaths, and made and subscribed the Declaration, and also taken and subscribed the Oath of Abjuration, pursuant to the Statutes. Commons will send an Answer about their Members attending. The Messengers ordered on Thursday last to go to the House of Commons, to desire they will give Leave, That Lieutenant General Wade and Patrick Lindsay Esqurie may attend this House, touching the Examination of Matters relating to the Murther of Captain Porteous, in Scotland," acquainted their Lordships, That the Commons would return an Answer by Messengers of their own." Byde's Pet. referred to Judges. Jelfe's Pet. referred to Judges. Swymmers, Pet. referred to Judges. Hodie 1a vice lecta est Billa, intituled, "An Act for Sale of the Capital Messuage of Gunnersbury, and other Lands and Hereditaments, late the Estate of Sir John Maynard Knight, Serjeant at Law; and for purchasing another Estate, pursuant to the Uses of his Will." 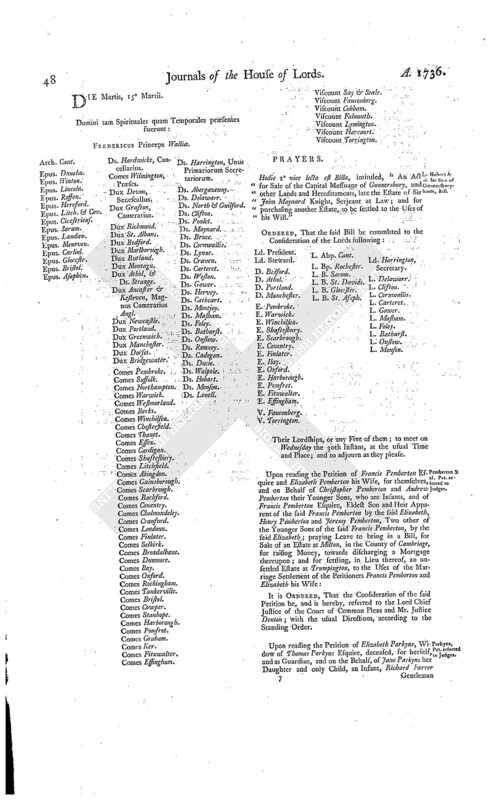 Upon reading the Petition of Roger O'Farrell; setting forth, "That, in February 1734, he exhibited an Appeal to this House, from Orders and Decrees of the Chancery of Ireland; and though he obtained peremptory Orders on the Respondents to put in their Answers in a Week, yet they neglected so to do till this Session, in which some of them have answered, but others have not;" and praying, "That the said Appeal may be heard on Wednesday the 6th Day of April next peremptorily, or on such other Day after as to this House shall seem meet:"
It is Ordered, That the said Appeal be heard, by Counsel, at the Bar of this House, on the said 6th Day of April next, notwithstanding some of the Respondents thereunto have not yet put in their Answers. Hodie 2a vice lecta est Billa, intituled, "An Act to enable the Trustees in the Will of Thomas Kellow Gentleman, deceased, to sell Part of his Estate, for the Payment of his Debts." V. Falmouth. Ld. Abp. Cant. L. B. St. Asaph. L. Clifton. Their Lordships, or any Five of them; to meet on Tuesday the 29th Instant, at the usual Time and Place; and to adjourn as they please. 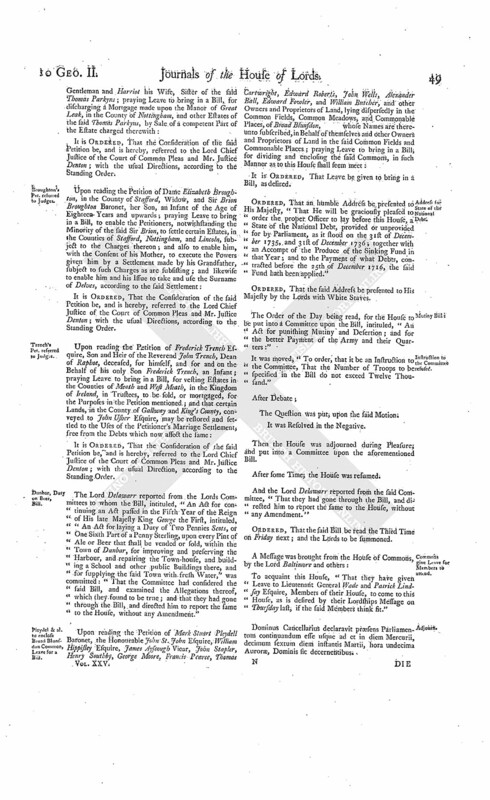 It is Ordered and Adjudged, by the Lords Spiritual and Temporal in Parliament assembled, That the said Interlocutors complained of in the said Appeal be, and the same are hereby, affirmed, with the Variations following in the First Interlocutor complained of, That, instead of these Words ["the Onerous Cause of the said Bonds"], these Words be inserted, videlicet, ["the Whole of the Onerous Causes of the said Bonds insisted on by the Appellants"]; and in the other Interlocutor complained of, instead of these Words ["the said Bonds void and null"], these Words be inserted, (videlicet,) ["That the Money really and actually advanced upon the said Bonds, and the Interest thereof, has been paid off and satisfied."]" Dominus Cancellarius declaravit præsens Parliamentum continuandum esse usque ad et in diem Martis, decimum quintum diem instantis Martii, hora undecima Auroræ, Dominis sic decernentibus. L. Hobart & al. for Sale of Gunnersburyhouse, Bill. Hodie 2a vice lecta est Billa, intituled, "An Act for Sale of the Capital Messuage of Gunnersbury, and other Lands and Hereditaments, late the Estate of Sir John Maynard Knight, Serjeant at Law; and for purchasing another Estate, to be settled to the Uses of his Will." Their Lordships, or any Five of them; to meet on Wednesday the 30th Instant, at the usual Time and Place; and to adjourn as they please. Pemberton & al. Pet. referred to Judges. Parkyns, Pet. referred to Judges. Broughton's Pet. referred to Judges. Trench's Pet. referred to Judges. It is Ordered, That the Consideration of the said Petition be, and is hereby, referred to the Lord Chief Justice of the Court of Common Pleas and Mr. Justice Denton; with the usual Direction, according to the Standing Order. The Lord Delawarr reported from the Lords Commitees to whom the Bill, Intituled, "An Act for continuing an Act passed in the Fifth Year of the Reign of His late Majesty King George the First, intituled, "An Act for laying a Duty of Two Pennies Scots, or One Sixth Part of a Penny Sterling, upon every Pint of Ale or Beer that shall be vended or sold, within the Town of Dunbar, for improving and preserving the Harbour, and repairing the Town-house, and building a School and other public Buildings there, and for supplying the said Town with fresh Water," was committed: "That the Commitee had considered the said Bill, and examined the Allegations thereof, which they found to be true; and that they had gone through the Bill, and directed him to report the same to the House, without any Amendment." Pieydel & al. to enclose Broad Blunsdon Common, Leave for a Bill. Address for State of the National Debt. Ordered, That an humble Address be presented to His Majesty, "That He will be graciously pleased to order the proper Officer to lay before this House, a State of the National Debt, provided or unprovided for by Parliament, as it stood on the 31st of December 1735, and 31st of December 1736; together with an Accompt of the Produce of the Sinking Fund in that Year; and to the Payment of what Debts, contracted before the 25th of December 1716, the said Fund hath been applied." 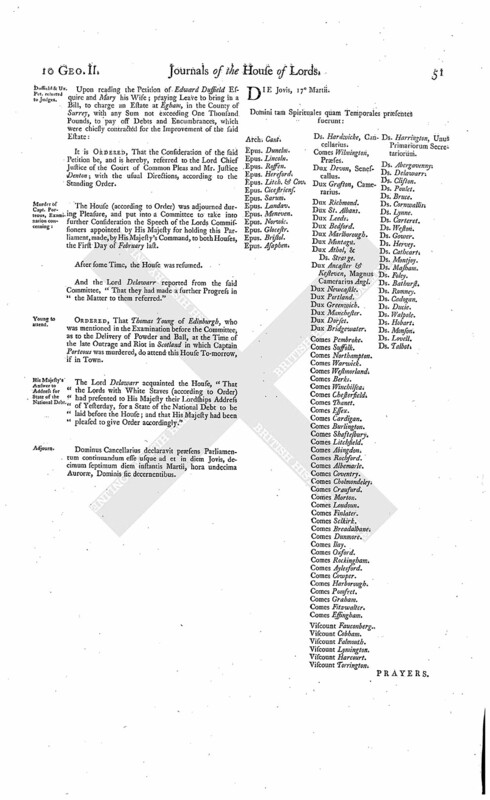 The Order of the Day being read, for the House to be put into a Committee upon the Bill, intituled, "An Act for punishing Mutiny and Desertion; and for the better Payment of the Army and their Quarters:"
Instruction to the Committee refused. It was moves, "To order, that it be an Instruction to the Commitee, That the Number of Troops to be specified in the Bill do not exceed Twelve Thousand." Then the House was adjourned during Pleasure; and put into a Committee upon the aforementioned Bill. After some Time; the House was resumed. Ordered, That the said Bill be read the Third Time on Friday next; and the Lords to be summoned. To acquaint this House, "That they have given Leave to Lieutenant General Wade and Patrick Lindsay Esquire, Members of their House, to come to this House, as is desired by their Lordship Message on Thursday last, if the said Members think fit." Dominus Cancellarius declaravit præsens Parliamentum contiuandum esse usque ad et in diem Mercurii, decimum sextum diem instantis Martii, hora undecima Auroræ, Dominis sic decernentibus. With a Bill, intituled, "An Act for naturalizing Godfrey Wichelhausen, John Francis Noppe, and John Stephen Masson;" to which they desire the Concurrence of this House. Barband & al. Pet. to be added to it. 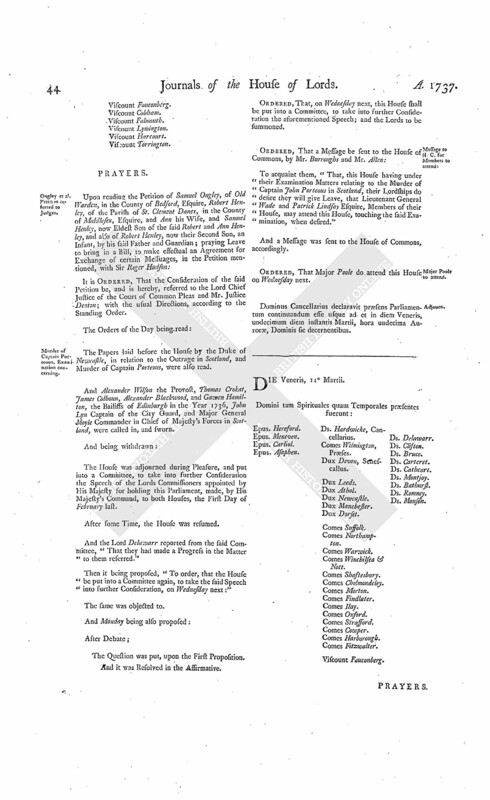 Upon reading the Petition of Thomas Barband and John Dillman; praying, "That their Names may be inserted in the said Bill:"
Hodie 3a vice lecta est Billa, intituled, "An Act for continuing an Act passed in the Fifth Year of the Reign of His late Majesty King George the First, intituled, An Act for laying a Duty of Two Pennies Scots, or One Sixth Part of a Penny Sterling, upon every Pint of Ale or Beer that shall be vended or sold within the Town of Dunbar, for improving and preserving the Harbour, and repairing the Townhouse, and building a School and other public Buildings there, and for supplying the said Town with fresh Water." Sir R. Graham & al. Pet. referred to Judges. Duffield & Ux. Pet. referred to Judges. 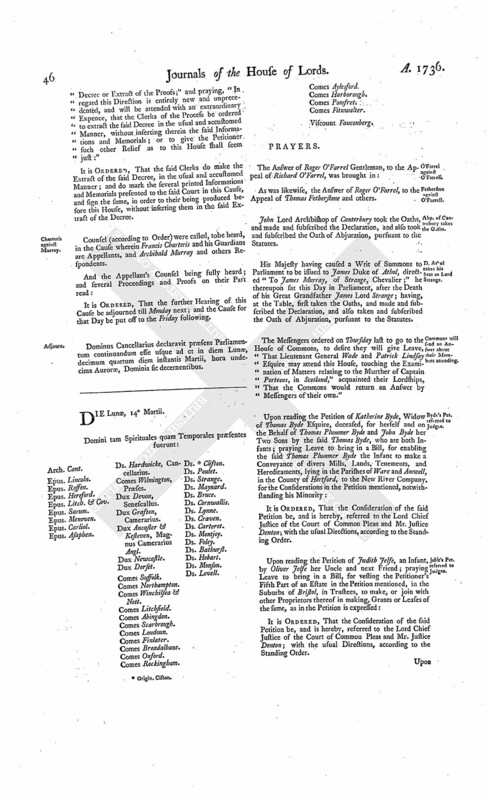 The House (according to Order) was adjourned during Pleasure, and put into a Committee to take into further Consideration the Speech of the Lords Commissioners appointed by His Majesty for holding this Parliament, made, by His Majesty's Command, to both Houses, the First Day of February last. And the Lord Delawarr reported from the said Committee, "That they had made a further Progress in the Matter to them referred." Ordered, That Thomas Young of Edinburgh, who was mentioned in the Examination before the Committee, as to the Delivery of Powder and Ball, at the Time of the late Outrage and Riot in Scotland in which Captain Porteous was murdered, do attend this House To-morrow, if in Town. His Majesty's Answer to Address for State of the National Debt. The Lord Delawarr acquainted the House, "That the Lords with White Staves (according to Order) had presented to His Majesty their Lordships Address of Yesterday, for a State of the National Debt to be laid before the House; and that His Majesty had been pleased to give Order accordingly." Dominus Cancellarius declaravit præsens Parliamentum continuandum esse usque ad et in diem Jovis, decimum septimum diem instantis Martii, hora undecima Auroræ, Dominis sic decernentibus. Dux Athol, & Ds. Strarge. L. Talbot takes his Seat. William Lord Talbot sat first in Parliament, after the Death of his Father Charles Lord Talbot; having, at the Table, first taken the Oaths, and made and subscribed the Declaration, and also taken and subscribed the Oath of Abjuration, pursuant to the Statutes. Thomas Barband and John Dillman took the Oaths of Allegiance and Supremacy, in order to their Naturalization. Wichelhausen & al. Nat. Bill. Hodie 2a vice lecta est Billa, intituled, "An Act for naturalizing Godfrey Wichelhausen, John Francis Noppe, and John Stephen Masson." Their Lordships, or any Five of them; to meet at the usual Time and Place, To-morrow; and that the Petition of Thomas Barband and John Dillman, praying to be added to the said Bill, be referred to the said Committee. E of Rockingham & al. Pet. referred to Judges. Ordered, That the Cause wherein Dennis Delane Gentleman is Appellant, and Dennis Delane and others are Respondents, which stands for an Hearing To-morrow, be put off to Monday next. Murder of Capt. Porteous, further Examination concerning. And the Lord Delawarr reported from the said Committee, "That they had made a further Progress in examining into the Matter relating to the Outrage and Riot in which Captain Porteous was murdered." Ordered, That the House be put into a Committee again, to take into further Consideration the Speech of the Lords Commissioners appointed by His Majesty for holding this Parliament, made, by His Majesty's Command, to both Houses, the First Day of February last, To-morrow. Dominus Cancellarius declaravit præsens Parliamentum continuandum esse usque ad et in diem Veneris, decimum octavum diem instantis Martii, hora undecima Auroræ, Dominis sic decernentibus. Upon reading the Petition of Humphry Stoacks, Defendant in a Writ of Error brought into this House the 8th Instant; praying, "In regard John Medley and others, Plaintiffs, have not assigned Errors upon the said Writ, according to their Lordships Standing Order; that the same may be Non pros'd, with Costs:"
It is Ordered, That the Petitioner do forthwith enter a Non pros. on the said Writ of Error, as desired; and that the Record be remitted to the Court of King's Bench, to the End Execution may be had upon the Judgement given in that Court, as if no such Writ of Error had been brought into this House: And further, that the Plaintiffs in Error do pay, or cause to be paid, to the Defendant in Error, the Sum of Ten Pounds, for his Costs, by reason of the Delay of the Execution of the said Judgement. 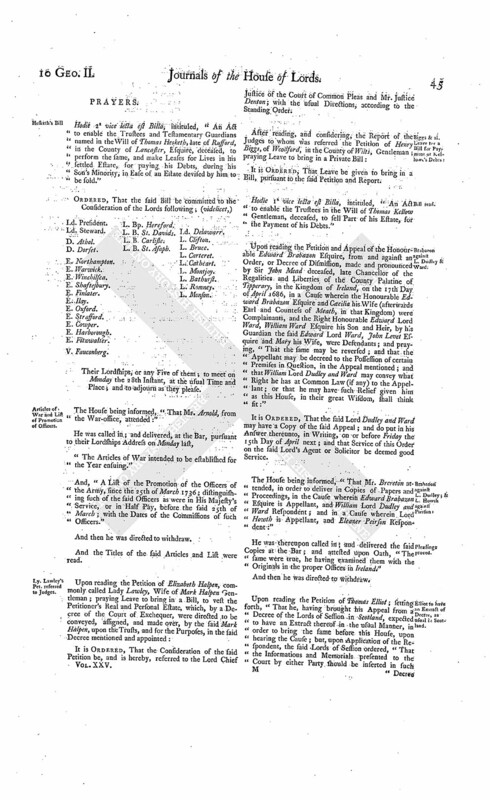 The Lord Delawarr reported from the Lords Committees to whom the Bill, intituled, "An Act to enable Trustees, during the respective Minorities of George Talbot Esquire and his Younger Brothers, to grant Leases of the Estates of the said Infants, in the Counties of Salop, Worcester, Berks, Chester, Oxford, and Wilts," was committed: "That they had considered the said Bill, and examined the Allegations thereof, which they found to be true; that the Parties concerned had given their Consents; and that the Committee had gone through the Bill, and made some Amendments thereunto." His Lordship made the like Report from the Lords Committees to whom the Bill, intituled, "An Act for Sale of certain Leasehold Estates, of Thomas Cooke Esquire, in the County of Gloucester; and for settling some Freehold and Copyhold Estates of Inheritance, of greater Value, to the same Uses, in Lieu thereof," was committed; except that their Lordships had made only One Amendment to the Bill. 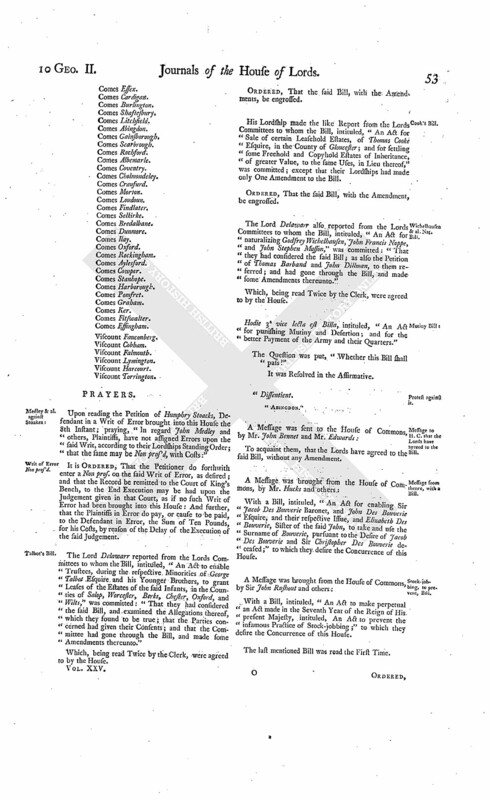 The Lord Delawarr also reported from the Lords Committees to whom the Bill, intituled, "An Act for naturalizing Godfrey Wichelhausen, John Francis Noppe, and John Stephen Masson," was committed: "That they had considered the said Bill; as also the Petition of Thomas Barband and John Dillman, to them referred; and had gone through the Bill, and made some Amendments thereunto." Message to H. C. that the Lords have agreed to the Bill. 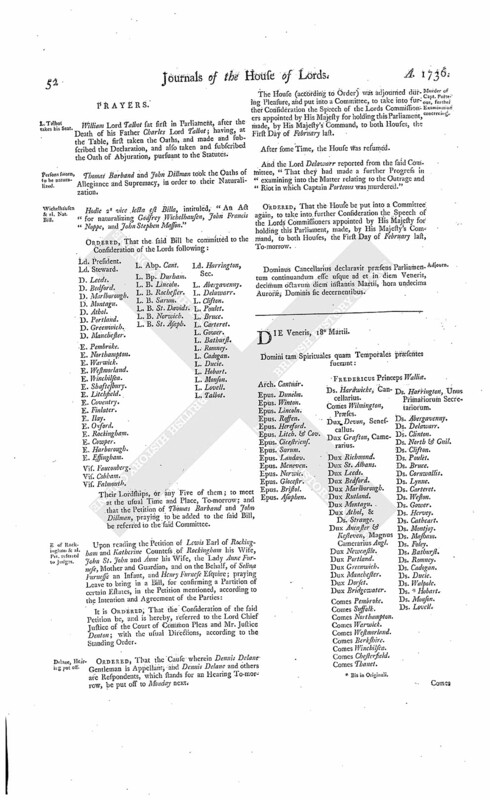 With a Bill, intituled, "An Act for enabling Sir Jacob Des Bouverie Baronet, and John Des Bouverie Esquire, and their respective Issue, and Elizabeth Des Bouverie, Sister of the said John, to take and use the Surname of Bouverie, pursuant to the Desire of Jacob Des Bouverie and Sir Christopher Des Bouverie deceased;" to which they desire the Concurrence of this House. Stock jobbing, to prevent, Bill. With a Bill, intituled, "An Act to make perpetual an Act made in the Seventh Year of the Reign of His present Majesty, intituled, An Act to prevent the infamous Practice of Stock-jobbing;" to which they desire the Concurrence of this House. Ordered, That Colonel Duroure, Lieutenant Colonel of Lieutenant General Whetham's Regiment, do forthwith attend this House. Then Lieutenant General Wade, Patrick Lindsay Esquire, the said Colonel Duroure, and Major Poole, were called in, and sworn, in order to be examined before the Committee of the whole House, appointed to consider further of the Speech of the Lords Commissioners appointed by His Majesty for holding this Parliament, made, by His Majesty's Command, to both Houses, the First Day of February last. Murder of Capt. Porteous, Examination concerning. And the House was adjourned during Pleasure, and put into the said Committee. Ordered, That, on Tuesday next, this House shall be put into a Committee again, to take into further Consideration the Speech of the Lords Commissioners appointed by His Majesty for holding this Parliament, made, by His Majesty's Command, to both Houses, the First Day of February last. Then it being moved, "That the Lord Justice Clerk in Scotland be ordered to attend this House on this Day Three Weeks:"
And it being also moved, "To adjourn:"
The Question was put, "Whether this House shall be now adjourned?" Dominus Cancellarius declaravit præsens Parliamentum continuandum esse usque ad et in diem Lunæ, vicesimum primum diem instantis Martii, hora undecima Auroræ, Dominis sic decernentibus.